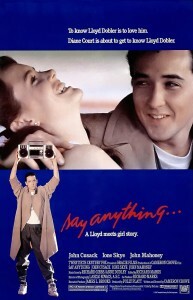 Say Anything… is a romantic drama written and directed by Cameron Crowe, starring John Cusack and Ione Skye. Eric shows up in several party scenes as Vahlere, the keymaster. He was also a production assistant on the film. Say Anything… was released in theatres in April 1989. It came out on DVD in March 2002. The 20th Anniversary Edition was released on DVD & Blu-ray in November 2009. The DVD of Say Anything has been a long time in coming, and thankfully it was worth the wait. Video is presented in 1.85:1 anamorphic widescreen. It’s not pristine, but it’s certainly acceptable. Colors are a bit subdued, though black levels are deep without washing out detail. There’s minimal edge enhancement or pixelization. It can be a bit grainy, but it’s not distracting and it’s something that’s expected from a movie over ten years old. Source artifacts are at a minimum. Audio is available in Dolby Digital 5.1 and 2.0 Surround, both remixed from its theatrical stereo. It’s forward centric except for the music, an integral part of all Cameron Crowe films. The laundry list of features is as follows: a commentary track, ten deleted scenes, 13 extended scenes, five alternate scenes, a featurette, two trailers, eight TV spots, and a photo gallery. Whew. The commentary track features Cameron Crowe, John Cusack, and Ione Skye. It’s a fun, informative track that never lags. If that’s not good enough, it’s not just a commentary track—there’s a 20-minute introduction with the three of them sharing their memories before the movie even starts! The film gets a reasonably solid Blu-ray transfer, which is honestly more than I expected. The film didn’t look great on DVD, and I figured that it might just get dumped into the hi-def format without much effort put into cleaning it up, but it thankfully appears that the folks at Fox have put some work into this 20th Anniversary release. The image is surprisingly clean and clear, boasting solid detail throughout. The darker scenes benefit from considerable clarity and depth. Flesh tones occasionally seem a tad too reddish, but it’s not a significant issue. The audio is excellent, particularly during the moments in which Crowe cranks up one of the many memorable tunes included on the soundtrack. Dialogue is clean and clear, mixing nicely with the sound design.